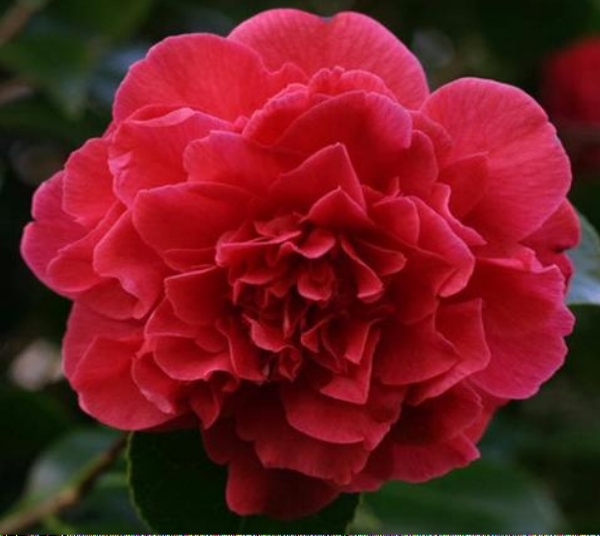 Before we brought our Gang of Eight home from the Virginia Camellia Society sale, enthusiastic and knowledgeable Society members told us what camellias liked. Organic soil on the acid side. Conscientious watering during the first year. 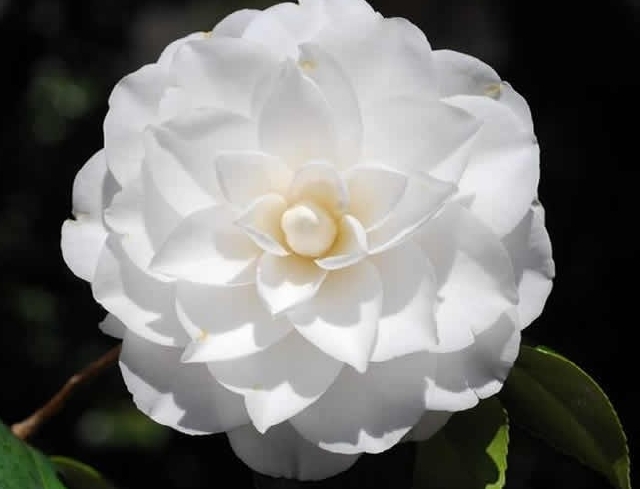 In this entry we will try to give you many suggestions for planting techniques that will lead to healthy, long-lived camellias. Tall pines form a benign upper story for camellias. Their thinly clad branches filter sunlight, cast dappled shade. Perfect for Japonicas whose leaves turn yellow in full sun, an ugly distraction from fresh spring blooms. Sasanquas are less finicky. They can tolerate a healthy dose of sunlight, and some bloom best in almost full sun. The roots, too, of pine trees are kind to camellias. 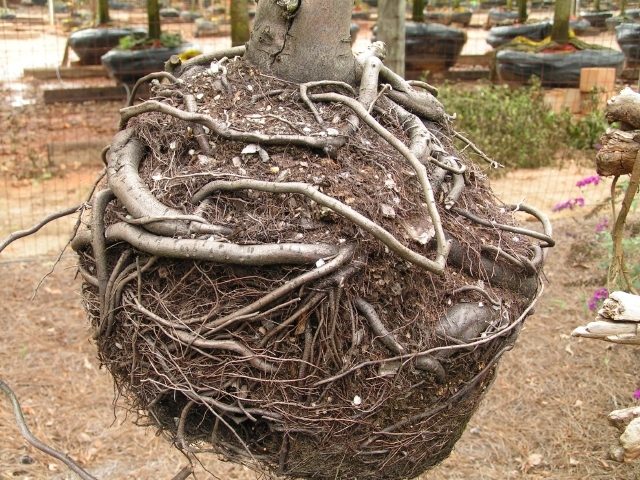 They go deep, so they do not compete with camellias’ surface roots. 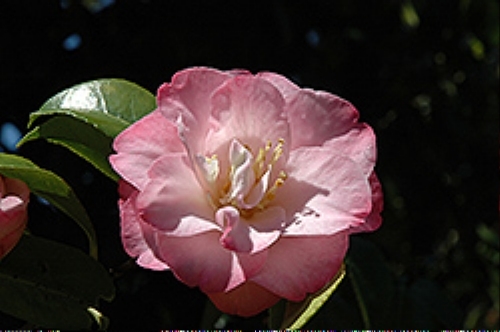 Planting camellias under deciduous trees can slow their growth and reduce bloom. Branches heavy with leaves cast deep shade and tree roots close to the surface spread out in lean soil and seem to home in on soil amended for planting. 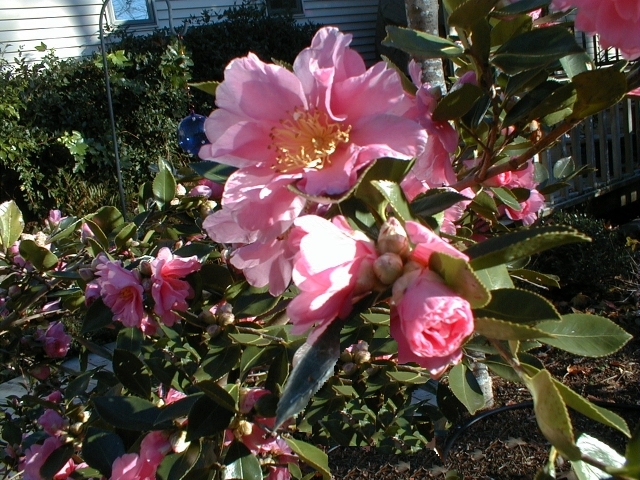 Young camellias must compete with mats of roots from large trees that siphon water and nutrients from the soil. The north side of a house can be a fine location, as long as some sunlight slips in and exhaust from a heat exchanger is not blowing a desert wind. Eastern exposures with morning sun are excellent in summer. 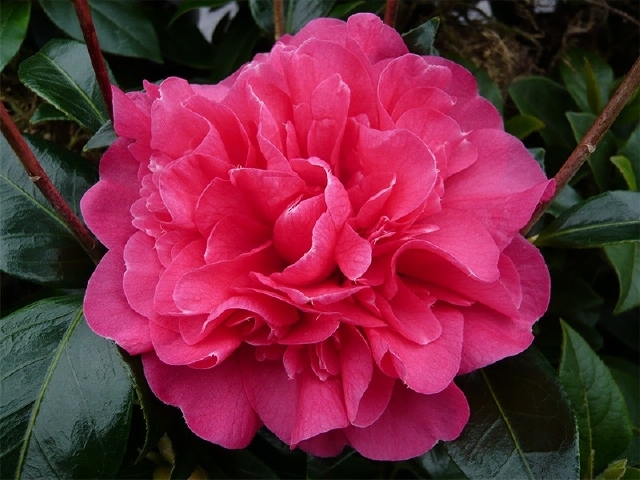 But they are tough on camellias in winter if they are not protected by pines or other evergreens. Our first camellias, that Gang of Eight, had it all. A fine western exposure sheltered from hot noonday sunlight by a mix of pines and hardwoods that shielded them from winter winds. We planted our Gang of Eight in fall, around October. It’s the best season for planting in our southern garden because soil is not yet soggy from winter rains but still warm enough to promote root growth. Plants have a good long time to settle in during cool seasons before the heat of summer. In northern climates, where winters are capricious and summers are cooler, spring planting is best. Our woodland garden gave freely of shade and shelter. But soil and drainage? Plant roots would either drown or rot if we dug holes in our clay soil. The verdict: No holes. A decision that cheered Master-Digger Master-Builder Bob to no end, at least temporarily. Long before raised beds became popular in gardens, we created raised beds for planting — out of necessity, not creativity. Instead of digging, we brought in several truckloads of coarse potting soil purchased from a local distributor. It was a grand combination of composted crumbly pine bark, with lesser amounts of sand, perlite, and vermiculite. 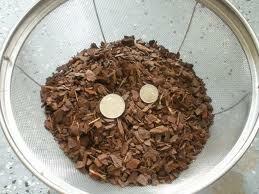 Composted pine bark is a fine soil amendment, but uncomposted pine bark makes a fine mulch. 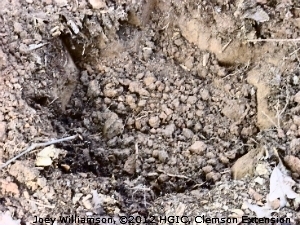 Its large nuggets are too coarse to incorporate into soil, and they tend to deplete soil of nitrogen as they decompose. On the other hand, as a mulch, their slow decomposition will add texture and nutrients gradually and help restore soil. Peat moss can be another villain in a planting bed. 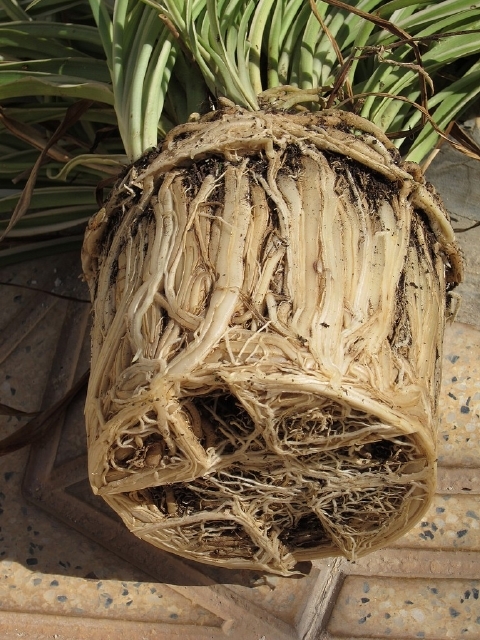 It is suspected of suffocating plant roots and causing root rot when it decomposes. Into this organic mixture, we incorporated many handfuls of crumbled clay, a real-soil addition to our raised bed. (First Gardener’s Aside: Years ago we gardened in “beach” sand. At least that’s what a little boy who visited with pail and shovel called it. In these conditions, it’s especially important to add lots of compost/organic matter/potting soil to beds. More than you think you will need. We waited a few days before planting to allow this crumbly, friable soil mixture to settle. New plants would be less likely to sink and collect water around their roots. (Second Gardener’s Aside: Today we also plant camellias and other plants directly in the ground. We dig wide and very shallow holes, maybe only half the depth of the rootball. Once the plant is placed, we back-fill around it with a combination of soil and compost to create a mound. This will prevent water from pooling around the plant. We adopted this technique after digging many lovely holes that we back-filled with fine, loose potting soil. Since water drains from clay soil with the speed of a sloth, the holes became soup bowls full of muck after rainy days. Our ratio is more like half native and half organic in the hope that we can break up the clay whose claim to fame is its ability to be molded into earthenware pots. We wondered if raising the level of soil would give grief to the original owners of the bed — a large loblolly pine and a proud male holly with a handsome cone shape. Happily, they seemed to relish the garnish and did not chafe at the unexpected rise in soil level. Their roots moderated moisture in the soil after heavy rains. Our camellias seemed to have everything they needed to grow. And grow they did. We would not know how important those trees were to our Gang of Eight until several years later. Soil tests from the NC Department of Agriculture told us our soil was neutral, a surprise to us because we had so many pine trees on the property. We later learned that clay soil with high magnesium and calcium levels tends to be neutral, despite that constant fall of pine needles. Over time, adding organic amendments and mulching will move upper soil layers into the acid range. It’s worth noting that most young plants, even camellias and other acid-loving plants, make their best growth in neutral (7.0 pH) soil. As seasons roll by, and pine needles and leaves fall and mulch decomposes, soil will reach a level of acidity (about 5.5 to 6.5 pH) that will satisfy the needs of camellias as they age. We settled for what we had. We could have put down annual applications of flowers of sulfur to promote acidity. We did not because we had bought unlimed, naturally acidic potting soil directly from the manufacturer/distributor. We also counted on gradual decomposition of mulch to increase soil acidity. Fortunately, there was no masonry or concrete near our new bed that could leach lime into it. Such leaching can mean slow death for camellias. 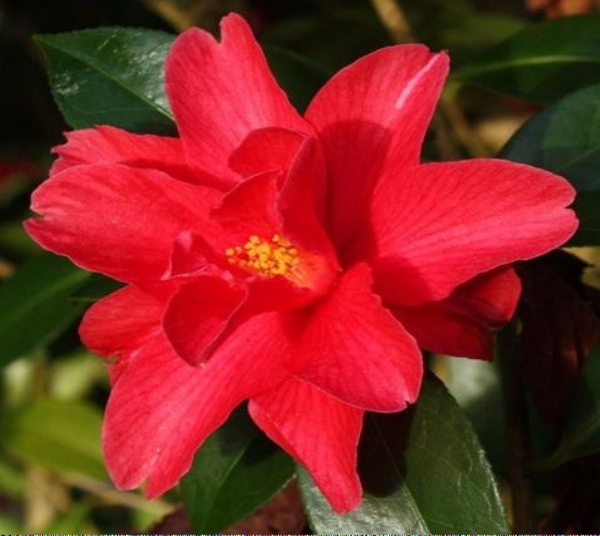 Eventually, camellias and other acid-loving plants like rhododendrons fail to thrive in soils that are alkaline. Unless you understand the pH connection, their poor health and yellow leaves remain a mystery. (Third Gardener’s Aside: One product, aluminum sulphate, is often added to soil around hydrangeas to lower pH and provide aluminum to promote blue blooms. 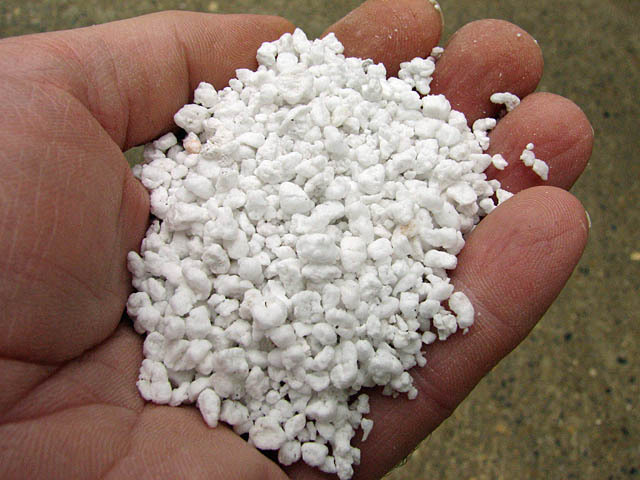 Aluminum sulphate is a weak substitute for sulfur, and large quantities are needed to achieve results. Before we did any planting, we inverted the pots and inspected root balls. 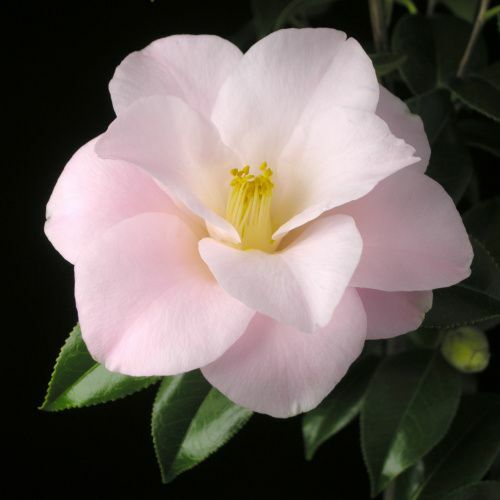 The Virginia Camellia Society sells camellias from a reputable nursery, where the plants are all well grown, with healthy roots out to the edge of the root ball. They were not pot bound. 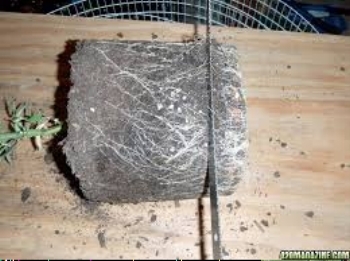 There would be no tugging and tearing at roots welded into a brick before planting. Healthy roots are critical for long-term success. Inspecting them prior to purchase gives you a sense of root quality. You can do this yourself or ask the nurseryman to do it for you. Bob does this faithfully. I do not because I am usually so enamored of a plant I want to buy that I do not want any bad news. So I bury my head in the sand and then I am sorry. Pot-bound plants are severely handicapped. Survival is compromised. Fully 80 percent of roots are already dead. Those still alive may be trapped in the center of the pot. Treatment calls for massive doses of tough love. Many times I’ve had to cut deep into root balls with a sharp knife and tear apart roots and drastically prune dark dead roots so space opens up for new roots to emerge. New roots are often the plant’s only hope of survival. Bob and I particularly check for older, woody twisted or curling roots. These are summarily clipped unless they can be straightened (usually not). 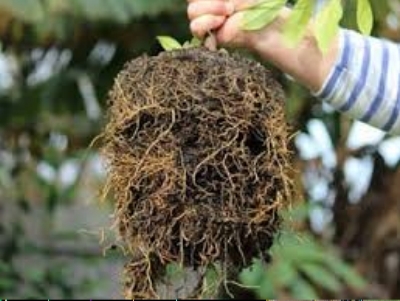 If left unchecked, such ill-grown roots, unseen, can prevent healthy roots from spreading naturally. In severe cases, the plant either dies or limps along for years, a puzzle in the garden because there seems to be no reason for its failure to thrive. Sadly, years of great expectations become years of disappointments. If roots need major surgery, the top of the plant should be pruned back and flower buds removed to balance for losses to roots. After drastic surgery, we usually do not put a plant directly in the ground, though sometimes we’ve direct-planted torn-apart plants and they’ve done very well. Like so much of gardening, it’s a judgment call. If we think a plant is too weak, we pot it in potting soil (not garden soil) with added perlite and keep it in a cool, shady sick bay until we see strong, healthy growth — and nice roots. This can take a year or more, sometimes. Our plants were not potbound. We only had to tease the roots gently with our fingers to loosen the root ball and pull young, wayward roots to vertical. Teasing and moderate pruning can actually stimulate root growth. Since we were planting our camellias in a raised bed which had been allowed to settle, planting was easy. We nestled the plants into the mixture, about six to eight feet apart. We firmed and watered our plants, and mulched them with about three inches of pine bark, careful to keep the mulch away from the base of the plant. 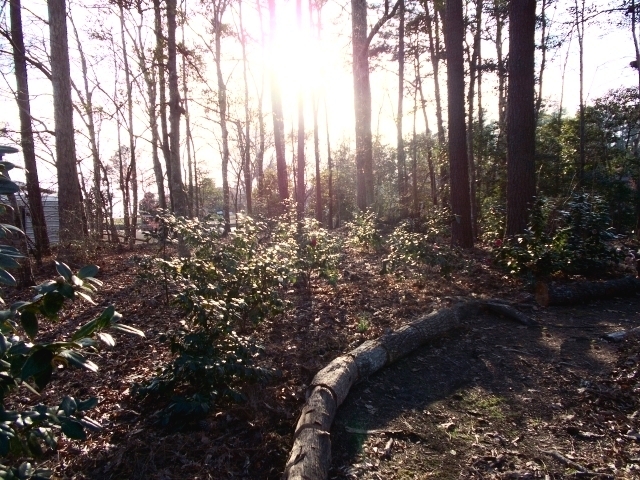 The slow decomposition of pine bark mulch would continue to create an organic, woodland soil that camellias like so much. Later, pine needles that fell naturally on the bed, would take the place of bark mulch. A low hedge of dwarf pittosporum fronted the camellias. The native male holly stood sentinel. When the sun shone on these plants, their leaves glowed, handsome, rich and green. And we were proud of our work. 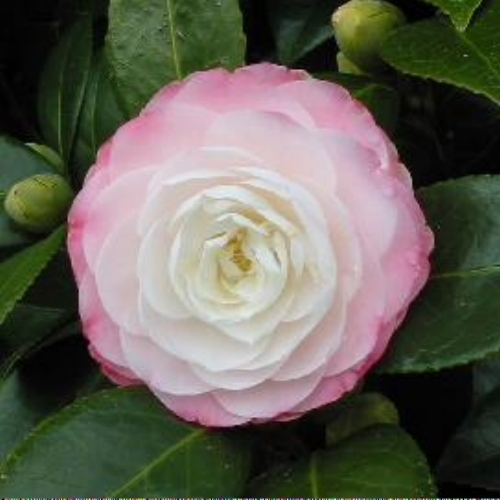 We thought it would be a forever planting, but great changes were to come to our garden, and these first camellias would come to resent the changes. Unfortunately, we never took pictures of that original planting. Nor did we photograph the lovely blooms.